Home > Blog > Featured > Bushrangers: glorified criminals, or anti-authoritarian folk heroes? Bushrangers: glorified criminals, or anti-authoritarian folk heroes? So how can we determine the truth about our bushrangers? Should we admire or revile them? Were they cold-hearted criminals or misunderstood victims of their times? As historians, we have certain tools available to help us understand the past. One of these is the study of the artefacts that have passed down to us from those times. In the case of bushrangers, I’d argue that the artefacts that are most relevant are headstones and testimonial presentations where the people who lived through the bushranging terror still speak to us through their inscriptions. These contemporary words do not spare the contempt that our pioneers felt when referring to the ‘bushranging menace’, nor their admiration for those who opposed them. So what did contemporary citizens think of the bushrangers: legends or criminals? The artefacts give us the best clues. These insights should determine our modern way of defining the bushrangers. ….We grew up hearing about bushrangers; few hear about their opponents. Arguably, our most famous bushranger hunter was Senior Sergeant Andrew Cleary of the Bourke Police. Following his relentless pursuit of bushrangers across vast outback plains, including the capture of Frank Pearson, the prominent citizens of Bourke presented him with an illuminated presentation certificate and purse of coins in 1868. 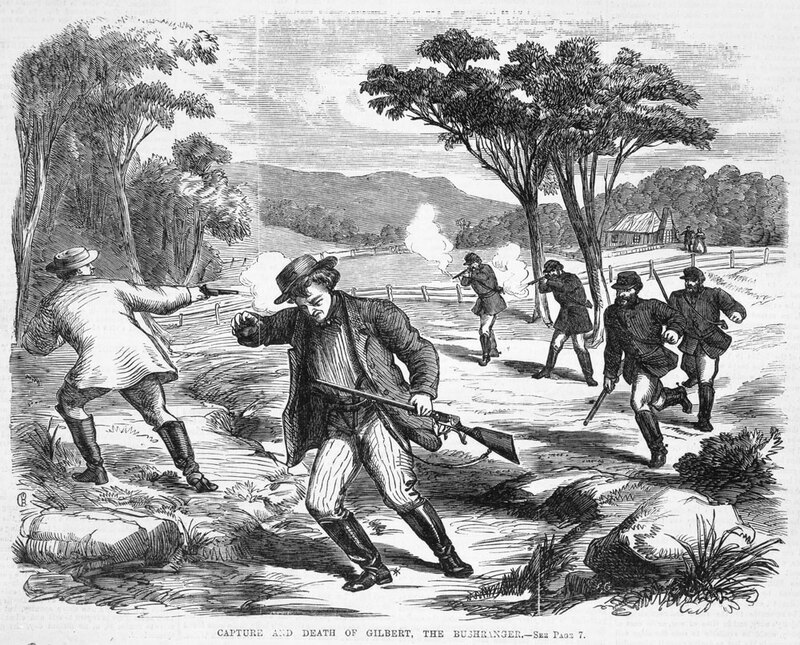 An engraving from 1865 illustrating the police chase of bushranger John Gilbert, as a family looks on in the background. Courtesy State Library of Victoria, ID IAN24/06/65/8. It seems astonishing that a largely law-abiding society would eulogise criminals as heroes. So why did this happen? Let’s explore this question through a case study example. Of all the bushrangers celebrated as folk heroes, it is not surprising that Frederick Ward alias Captain Thunderbolt was among them. In his youth, Fred epitomised all that was considered admirable in rural-born males, being considered so capable and reliable that, at the age of 11, he was employed to ferry a group of ‘city folk’ for 240 miles along the bushranger-plagued Great North Road. A decade later, however, this son of a convict received a 10-year sentence for possessing stolen horses and was sent to the hellish Cockatoo Island penal settlement. Fred worked hard and behaved well. Four years later, he received a ticket-of-leave to Mudgee. After escorting his lover, Mary Ann Bugg, to her Dungog family for their baby’s birth, he missed his quarterly muster. He eventually arrived at Mudgee’s police station on a ‘stolen’ horse. Despite evidence that it was a runaway horse, Fred was returned to Cockatoo Island to serve the remaining six years of his first sentence plus another three. An 1870 engraving of the capture and death of Fred Ward, aka Captain Thunderbolt. Courtesy State Library of Victoria, ID IAN18/06/70/116. Meanwhile, the parole system had been abolished for the newly convicted. Fred had to work alongside those whose hard work would still be rewarded. Prison riots and government promises failed to change the law. In 1863, Fred and a companion became the only successful escapees from Cockatoo Island. Their first known bushranging exploit involved stealing food from a shepherd’s wife. They allayed her fears by saying that they wouldn’t molest her, that they only wanted food and arms. “We merely rob the rich and not the poor,” they told her. And, in that moment, a legend was born…. But why did colonial society need bushranger heroes? The tale of the archetypal outlaw hero, Robin Hood, tells of a community suffering injustice and oppression with no recourse to the law to ease its suffering. Tension-riddled societies often spawn outlaw heroes who become the community’s avenging force against its oppressors. New South Wales in the 1860s — the time of the bushranging epidemic — was one such society. Read the full story in the latest edition of Inside History, the Jul-Aug issue. And let us know your thoughts in the comments below, or join the debate on our Facebook page: were bushrangers glorified criminals, or anti-authoritarian folk heroes?